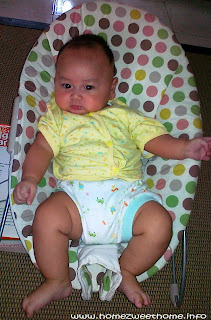 Meet my youngest nephew, Azman Fitra Ramadhan. He’s almost five months, but the weight is already 10 kilograms. He’s a big baby boy! 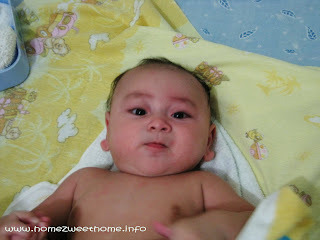 When we visited his parents’ house two weeks ago, I’ve got a chance to take some pictures; after having an afternoon bath. He’s a special boy, since his parents have waited for eighteen years for having a baby. May his adorable face brighten your Monday! Oh he is so cute!! My MYM, have a great week ahead! very cute little boy,woderful gift from God. happy MYM! he is a blessing. :) very cute. wow big kid and really cute too. What a very special Mellow Yellow post. What joy his parents must be feeling, after an 18 year wait. I'll bet it will be hard not to spoil him. He is a handsome young man. Eighteen years is a LONG wait for a baby! May he prosper! he looks cute...I like his name! How cute! Great photos of him. hey there! I just followed your blog, pls. visit and follow mine 2! tnx! Oh, what a happy thing, to wait so long and have such a beautiful baby boy. I love the wisdom of his gaze.